9.4.18 If you think club wheat’s distinctive head is what makes it special to the Japanese and other countries that specify it in their tenders, think again! In episode 89, Fascinating Things II: A Conversation With Craig Morris, director of the Western Wheat Quality Lab, you’ll discover how breeders and cereal chemists have used club wheat to insert all manner of quality attributes. In this episode, Morris also talks about the history of the WWQL—which is celebrating an anniversary this year—and what a million dollars in funding for new equipment has meant for the facility. 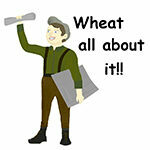 Subscribe on iTunes or other podcast apps or go to wagrains.org to access Wheat All About It. Connect your smart phone by Wi-Fi or a four bar cellular link for quick downloads which can be listened to later in the tractor, truck, combine or easy chair.